Four of MLB.com's top 100 prospects were honored by the Florida State League on Wednesday, but it was two players outside their respective farm systems' top 30 that took home the biggest awards in the Class A Advanced circuit. 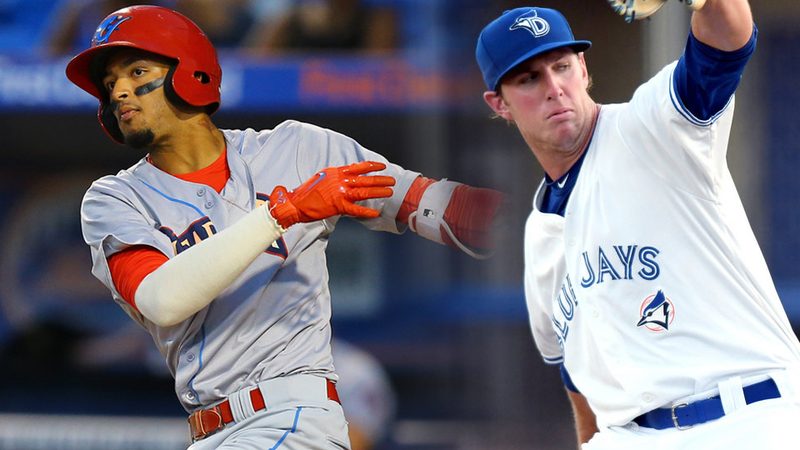 Clearwater outfielder Jose Pujols was named the FSL Player of the Year while Dunedin right-hander Patrick Murphy claimed Pitcher of the Year honors to headline the end-of-season All-Star list, the league announced. Pujols hit .301/.364/.523 with 18 homers, one triple and 16 doubles in 95 games with the Threshers before being promoted to Double-A Reading on Aug. 3. His .887 OPS and 153 wRC+ each rank second in the FSL among qualifiers while his 18 homers are still tied for fourth-most in the circuit, despite all the missed time. The 22-year-old right fielder also earned the top position player award because of his defensive work -- his 11 outfield assists tied for most in the league this season. Murphy has been the league's workhorse this season with his 25 starts and 141 2/3 innings each leading the FSL. His 130 strikeouts also sit atop the leaderboard while his 2.67 ERA ranks second and his 1.20 WHIP third among qualifiers. The four top-100 prospects named to the All-Star team were No. 19/Daytona outfielder Taylor Trammell (.277/.374/.406, 24 steals), No. 31/Charlotte outfielder Jesus Sanchez (.301/.331/.462, 10 homers), No. 39/Florida right-hander Ian Anderson (2.52 ERA, 118 strikeouts in 100 innings) and No. 57/St. Lucie shortstop Andres Gimenez (.282/.348/.432, 28 steals). All but Trammell, who missed time earlier this month with concussion symptoms, have already been promoted to Double-A. Daytona outfielder Ibandel Isabel slugged his way to the DH spot on the end-of-season All-Star list. The 23-year-old set an FSL record with 35 home runs in 100 games with the Tortugas and leads the Minor Leagues with 36 long balls overall. His .580 slugging percentage and .917 OPS are also tops in the FSL. Palm Beach's Dann Bilardello was named Manager of the Year. The Cardinals have already clinched a spot in the postseason by winning the FSL South first-half division title and own the best overall record at 72-56.